Floating is a wonderful way to reach deep relaxation, ease pain, and tap your full creative potential. We’re excited about the possibilities and can’t wait to bring floating back to Boston! Other names for float tanks include isolation tanks, sensory deprivation tanks, and R.E.S.T. – which stands for Restricted Environmental Stimulation Therapy (or Technique). They all involve floating in ten to twelve inches of warm water semi-saturated with Epsom salt — 800 lbs to a tank! The Epsom salts increase the density of the water to greater than the Dead Sea, allowing you to float effortlessly — easily keeping your nose and mouth above the waterline. We hope to bring a commercial float center back to Boston area, after too long an absence. But many things need to occur first — we’re still in the planning stages. 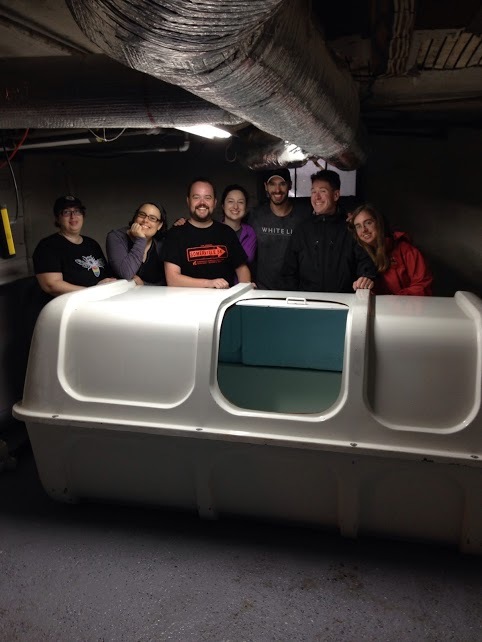 “Somerville couple starting sensory deprivation tank business”, Somerville Journal, Dec 5, 2013. An article about us, as we were putting this project together. Why nothing really matters (my trip inside an isolation tank). “The way you phys­i­cally feel after­wards is like get­ting a mas­sage, doing a full work­out, and get­ting 8 hours of sleep all at once… Until you try it, you won’t under­stand what I’m talk­ing about.” Posted March 28th, 2012. The Float Experience. A nice primer from Oasis, a manufacturer of classic tanks. Fibromyalgia Flotation Project. Have you been diagnosed with fibromyalgia? Consider participating in the non-floating control group while waiting for our center to open. Rod Borrie, The Fibromyalgia Flotation Project, 31:35. An investigator talks about the disease, his research, and the project results. “Without exception, the immediate intervention effects (average pre-post change) are highly significant [improvements] for all variables.” Slide set. David Manfield, Post-traumatic Stress Disorder (PTSD), 18:38. There are no published controlled studies on flotation REST and PTSD specifically. PTSD is a stress disorder notable for elevations in cortisol, ACTH and epinephrine; research on flotation clearly shows it can reduce all of these. Slide set. “Sensory Deprivation Boosts Musicians’ Skill Level“, Pacific Standard, May 16, 2011. Half of a university-level jazz improvization class does a month of floating, and has significantly greater performance improvement. “How does meditation change the brain?”, Scientific American, Oct 30, 2013. “Although areas of the brain responsible for sustaining attention usually shrink as we age, meditation counteracts this decay.” The relationship between meditation and REST is virtually unstudied, but anecdotally many people expect there to be similarities. “The Emergence of Contemplative Neuroscience,” Richard Davidson, Meng Wu Lecture, Oct 29, 2012. (video, 1h36m). Compassion meditation vs mindfulness practices, history of research, impacts on brain activity and gene expression, and investigations with children. “Lupus and Flotation Therapy,” What is Flotation? Oct 3, 2014. There’s no published research, but the benefits of floating match well with the symptoms and pain of lupus. “Silent Spectrum”, Mélanie Bérubé, 7:15. A short documentary about the spiritual side of floating. Darren Weissman, Sensory Deprivation Tanks, Part 1, 5:29. A holistic practitioner describes the experience of floating and talks about some of the benefits he sees. Woo factor 8 out of 10. Darren Weissman, Improving Sports Performance and Learning, Part 2, 5:42. A holistic practitioner talks about the value of visualization in float tanks. David Conneely, Programming and Metaprogramming, 40:54. What the mind believes to be real can trap you. Flotation can give access to reprogramming the subconscious. Conneely discusses the techniques of John Lilly. Slide set. “Floating for recovery and athletic performance,” Cocoon Floatation, Jan 30, 2014. In 1994, pro cyclist Brett Dennis smashed his femur through his hip socket, and was told he might not walk again. He used flotation as a key part of his remarkably rapid recovery programme. “Flotation tanks catch on for fighting stress, pain”, Tennessean, Nov 13, 2013. The opening of Nashville Float and Massage. 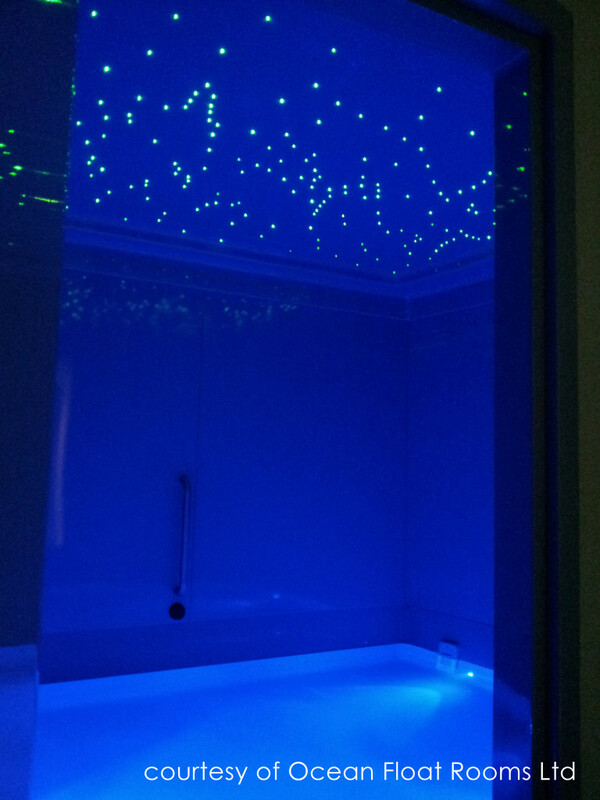 “Everything You Ever Wanted to Know About Sensory Deprivation Tanks”, io9, Oct 12, 2011. History and development of float tanks, the theories of John C. Lilly, Fringe‘s Walter Bishop, psychedelia, and hallucinations. “To Relieve Pressures, Try an Isolation Tank”, New York Times, Sep 10, 1981. A blast from the past, the first wave of float tanks. ”I think that in our culture we need a socially acceptable place where we don’t have to answer the telephone or questions from our children or argue anything with anybody,” said Dr. John Lilly. The Floatcast. Podcasting about floating by Tom Wunk of the Long Island Float Place. “I Floated for an Hour in a Sensory Deprivation Tank and All I Got Was an Irrational Fear of Snakes”, Ciena Madrid, The Slog, Sep 4, 2013. Her first float had high points (“lying still feels almost like flying, which is to say, euphoric”) and low points (“they do not warn you about the paranoia”). Russell Brand BBC 6 Pod Cast – isolation / sensory deprivation tank float experience, 7:19, Jun 8th, 2012. Michael Finnance, Float Tank Documentary, 5:39. Homemade intro to flotation, tanks and general discussion. Interesting material, poor sound quality. Warning: if you enter a float tank, you will certainly experience every one of these things shown below, probably simultaneously. As is well known, TV is invariably accurate, scrupulous, and truthful in every respect. The Simpsons, Make Room For Lisa, Episode S10E16, 20:32. Lisa takes Homer to a float center; Homer’s tank goes for a ride (starting from 13:20). Kumail Tours Portlandia – Float On, Webisode. Kumail visits the real Float On, encounters Ashkahn Jahromi’s impressive mustache. Fringe, Pilot, Episode S1E01, 2:08. “This will rip open your consciousness.” “I still think this is deeply irresponsible.” Walter just makes everything more complicated than it needs to be. Fringe, “Amber 31422”, Episode S3E05, 3:13. “In the isolation tank, you will be freed from sensory distractions, and so the part of your brain that enables you to travel between universes should be more accessible. And we will be helping the process along with psychotropic drugs.” Our tanks are not this awesome. Ricky Gervais Show, Floatation Tank/Munchies, 9:07. If you can still enjoy the basic things in life, then you can’t go wrong. Absolutely Fabulous, Iso Tank, Part 1, 10:00. Edna and Patsy get a tank shipped from LA. Altered States, the Tank, 0:55. Floating is just like in Altered States, but you’re not submerged in water, you don’t eat ritualistic mushrooms, and only a small percentage of floaters turn into proto-human monkeys. Johnny LaRue’s Discount Deprive-O-Rama, 2:39. And from SCTV, it’s John Candy bringing the fun to sensory deprivation.